Here’s my munchkind head, hanging out with me while I work. He’s cute and all, but every once in a while a paw will reach around and try to pick off a key from my keyboard, which I just had replaced by the way. John Maclay, our choir director, said this at the end of his last email. It’s about our upcoming Spring concert. When we call this a “Concert for Peace,” we mean not just peace in the literal, immediate sense (though we all devoutly wish it), but the peace that comes from knowing that through all its tortured ages, and even from the depths of war and all its carnage, human beings have an innate capacity for reconciliation, the spine to stand up to tyranny, and an ability to seek out the “new heavens and the new earth” that lie beyond. Armies can be defeated; human beings — soldiers, civilians — cannot. The first step to ending a war is to remember what peace feels like. These voices – yours, and those we read from – are powerful reminders. I’ve been feeling very jaded and hopeless these past few years. I’m astounded by Bush and those who surround him. Historians are going to look back and shake their heads at us and wonder why we didn’t do more to stop them. I’ve probably already posted that line before. I think it a lot. I do wonder what I should be doing, because I know I should be doing something. Anyway, I liked John’s hopeful email. Horrible people will eventually be subsumed, the pendulum will swing back (after many more dominoes fall as a result of the Bush Administration–sorry!). You know, believe it or not, I’m in a good mood today. I have a pretty yellow shirt on, I like my hair, I over-paid on my taxes so I don’t have to write a great big check this month, choir rehearsal is tonight and I will come home to American Idol after, and pizza, and cats, and the book is going well, my apartment is very clean, I mean the list goes on. Seriously, what should we be doing about Bush that we’re not doing? How can we make the world better? There was a guy on Jon Stewart the other night, who was like me, that this is bad on a truly horrible level, but he felt there was reason to hope and things we could do. Who was that guy?? I forget. Stacy,I know how you feel. I’ll never forget how depressed I was after Gore lost in 2000. What my wife and I have done is get involved in the fair trade movement. I chair our local group and Dori is one of the store managers. I know its a small bit but if everybody bought fair traded stuff it would really make a difference. 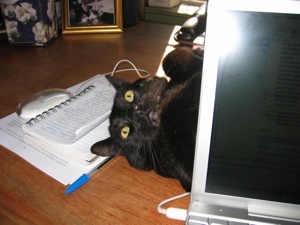 “watching” you write your latest book is very interesting. Is July 1 your deadline? Yes! I made out a little schedule of deadlines for each chapter and taped it to the lamp in front of me so I keep to it. And what happened about five minutes later? Finney started chewing on it. I wrote a book once for a college project called “The Activist’s Alphabet”. It was an illustrated A-Z of small things people can do every day to help their community – local to global. Maybe I should try to get that published someday. PS. When is your Concert for Peace? Nadine, I finally started turning the news off, too. And I feel the same about protesting. Molly, thank you. I am going to try to remember to post your suggestions. Maybe I will start a list, too. I’m a list-making type.